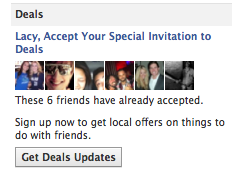 As of yesterday, Facebook’s new “Groupon killer” is live in five cities, including Dallas: Facebook Deals. When you opt into these deals, they will by default be delivered by email (the Groupon match) and in your news feed (the Groupon killer). I presume the emails can be stopped by navigating the preferences, but good luck with that. It’s not in Facebook’s interest to slow that train down. As you can see in the screenshot above, your friends can “like” the deals even if they don’t buy the deal. Even further, the deals are displayed to you with a notification that Friend X, Friend Y, and Friend Z already “like” the business this deal is from. If you decide to buy the deal, you can pay with a major credit card or with Facebook Credits. This marks the first time that real goods may be bought with Credits (technically, Credits buy vouchers, not real goods, but…you know). Facebook isn’t talking about the profit splits, though. By default, the deal you bought is posted on your profile, unless you uncheck a box that indicates it will do so. You can also buy deals for friends as gifts – it will be interesting to see if those deals are posted to the Friend’s profile (I presume they will). can focus on providing a great customer experience. link in the left-hand navigation column, so that people can find and buy your deal easily. 2. The Deals Page: This page shows your deal, along with others that are available for purchase in a given city. lets them buy your deal directly. Wall. This makes it easy for people to make plans together. 5. News Feed stories: News Feed stories appear on the Home Page and give people information about their friends. you’re offering in a natural and relevant way. people when their friend buys a deal for them. 7. Deals tab: Your deal is eligible to appear on the right-hand side of any deal that is currently running on a Facebook Page. 8. Emails: We’ll email people when friends like or buy a deal that they have liked as well. We’ll also send daily emails to people who have subscribed to our Deals updates. Whoa. That’s a lot of sharing. It’s practically a pile a golden-fried bacon – anyone with a functional brain and an interest in advertising is salivating. Well, so what? Now that we’ve covered the facts about this new service, let’s talk a little about the consequences. First of all, this is not a market where only one “deal” platform can win (short of blocking Groupon sharing from Facebook). By my previous posts, you’re aware that I’m primarily concerned with Facebook’s ability to seamlessly leverage the identities of its users to make money and what the future implications of this coup of control might be. To put it in a more plain way, you have the choice to put on a shirt in the morning that says “FACEBOOK”, and the average Joe is aware that by wearing that shirt, he is representing Facebook and showing that he supports it. No one shows up at Joe’s house and says “Joe! I’ll give you half off your lunch if you just wear this shirt!” By buying Deals, the average Joe is advertising to all of his friends for that company. That company then is able to leverage Joe’s support to convince his friends to support it too. In the end, that company has become a part of Joe’s identity – his friends will potentially remember that pairing for an indefinite amount of time (we are already trained to associate brands with people, afterall). On the bright side, maybe this will wake people up and let them understand in a very real way that their online actions are not so private, anyway. The hoops that you have to jump through to not share on Facebook is nothing compared to what’s being tracked and sold “out there” beyond Facebook.